Welcome to the idyllic coast of the Dornoch Firth, the home of Balblair Distillery. It’s here, since we rolled out our first barrels in 1790, that we’ve been producing award-winning Highland Single Malt Scotch whisky. At Balblair we only ever release our whisky when it’s ready. Every year our Distillery Manager, John MacDonald, selects whiskies that have reached their exact point of ‘optimum maturation’, the peak of perfection. That’s why we only create Vintages timed to perfection. Launched alongside 1990 & 1983 in November 2013, Balblair Vintage 2003 replaces Vintage 2002. The American oak, ex-bourbon barrels used in maturation impart toffee, butterscotch and vanilla notes. Balblair 2003 is golden amber in appearance. On the nose there are the signature Balblair aromas: floral and fragrant punctuated with citrus fruits, apricots and honey. On the palate it is full bodied, with notes of oranges, lemon, honey and spice. The long lasting finish is sweet yet spicy; a superbly well-balanced dram. 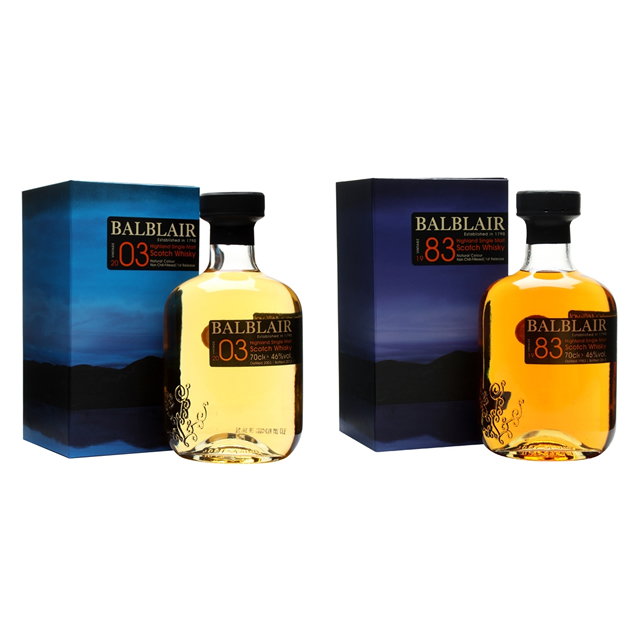 Matured in American oak ex-bourbon barrels, Balblair Vintage 1983 is a rich, warm dram, combining all core Balblair characteristics. Only just launched to replace the 2nd release of 1975 this stunning dram is sure to be just as popular as its predecessor.